When we think of wedding essentials, one of the first things that comes to mind is a cocktail hour. 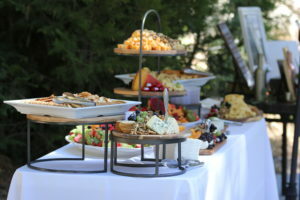 Serving hors d’oeuvres and refreshments is a great way to keep your guests entertained while the bride and groom are taking photos after the ceremony. It’s also a great time for guests to mingle among themselves with friends, old and new. Many brides underestimate or overlook the idea of a cocktail hour, but truth be told, it can be just as significant as serving dinner or having music. So what makes a perfect cocktail hour? Keep reading to find out and for a peak at our appetizer and bar upgrades. How much time you set aside for hors d’oeuvres is an important factor. Don’t be fooled by the name, a cocktail “hour” can last anywhere between 45 minutes to an hour and a half, depending on the amount of guests you’re expecting. We suggest taking at least one hour for refreshments and appetizers. Present a variety of different small plates for guests to try. SkyPark Weddings offers plenty of fun and delicious appetizer selections. Play it safe with some appetizer favorites like a fresh salsa and cream cheese platter served with assorted crackers and tortilla chips or upgrade to sauteed mushrooms, gourmet sweet & sour or jamaican meatballs, assorted cheese presentation (served with fresh grapes and walnuts), a fresh fruit cascade, or a vegetable presentation served with assorted dipping sauces. Try serving some fun appetizers, like grilled chicken skewers with marinated pineapple and bell peppers, a fresh shrimp presentation served with sliced lemon & cocktail sauce, or a walnut basil pesto cream cheese platter served with assorted crackers. We also offer prosciutto wrapped asparagus or prosciutto wrapped melon, jumbo shrimp shooters, tomato basil bruschetta with fresh mozzarella served on a fresh slice of cucumber or crostini, or california rolls. Our smoked gouda, salami, and grape tomato squares are a favorite! Now that your wedding guests just witnessed two of their favorite people tie the knot, they’re likely ready to celebrate at the bar and get the real party started. 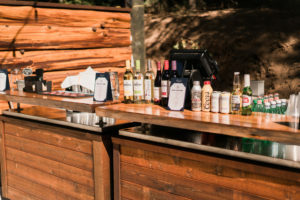 Depending on what kind of bar you’re planning on offering, our bar package presents a wide variety of choices. We offer everything from a premium hosted bar package to a hosted beer and wine bar package. You can even have a mimosa bar if you’re planning on a brunch wedding. Our champagne table service really keeps the party going! It may be a possibility that your friends or family don’t drink alcohol. If they don’t, you can still have a creative refreshment station with iced tea, lemonade, and flavored waters. 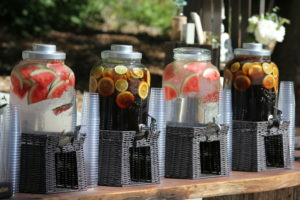 This is a great way to get guests who are drinking to stay refreshed between alcoholic beverages as well. A cocktail hour can be more than just drinks and food to entertain guests. 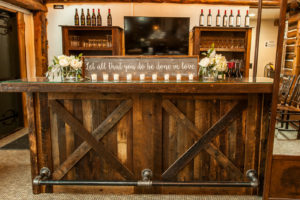 Other things to incorporate into your cocktail hour are photo booths, guest book signings, and fun games (like crossword or word search napkins). A combination of all of these and you’ll have a cocktail hour and wedding that your friends will be talking about for years to come. SkyPark Weddings is a premier Southern California wedding venue located in the San Bernardino National Forest. Surrounded by majestic mountains, the fairy tale wedding of your imagination can come to life. 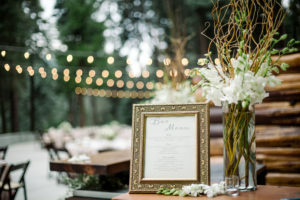 After the ceremony, your loved ones can enjoy the ambiance of the forest and celebrate this wonderful occasion underneath the full blanket of stars visible from this mountain peak. To visit our unique property, please contact us by emailing info@skyparkweddings.com or call 909-744-9924.